Tottenham Hotspur identify Leicester City star to replace Christian Eriksen? Maddison to replace Eriksen at Spurs? 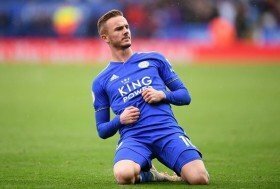 Leicester City midfielder James Maddison has reportedly been earmarked as a probable replacement for Christian Eriksen at Tottenham Hotspur in the summer. Eriksen has been a valuable performer for the north London side over the past five-and-a-half seasons but his future has recently been brought into question amid the speculated interest from Real Madrid. According to The Mirror, this has resulted in the north London club begin the search for a probable successor and Maddison has been identified as the prime target. Maddison only joined the Foxes from Norwich City at the start of the season but he has settled brilliantly with five goals and four assists in the Premie League alone. Meanwhile, Eriksen has shown no signs of extending his Spurs contract in recent times and the club may be forced to consider his sale in the summer where he will have just a year remaining on his deal.